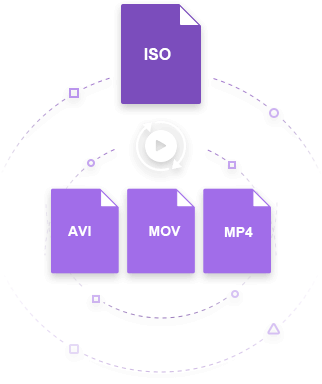 Convert ISO to AVI, MP4, MOV and any video formats for easy playback. 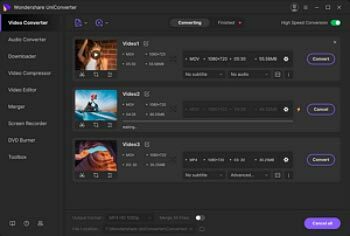 Versatile toolbox combines screen recorder, GIF maker, video metadata editor, etc. ISO file or image is a digital backup of the content present in a DVD, CD, and other discs. These files are not the actual videos, but the archive files. ISO files are large in size that will occupy a lot of storage on your system. Moreover, these files are not compatible with the majority of the players and devices. Sharing these files also creates problems. Thus, to come over all these situations, the best solution is to convert ISO to AVI, MP4, or MKV format that are commonly used video formats. Different types of ISO to AVI converters for converting ISO to AVI and other formats are discussed in the following part. There is no dearth of ISO to AVI converter in the market, and Wondershare UniConverter (originally Wondershare Video Converter Ultimate) is recommended because of its high-quality conversion and added features. 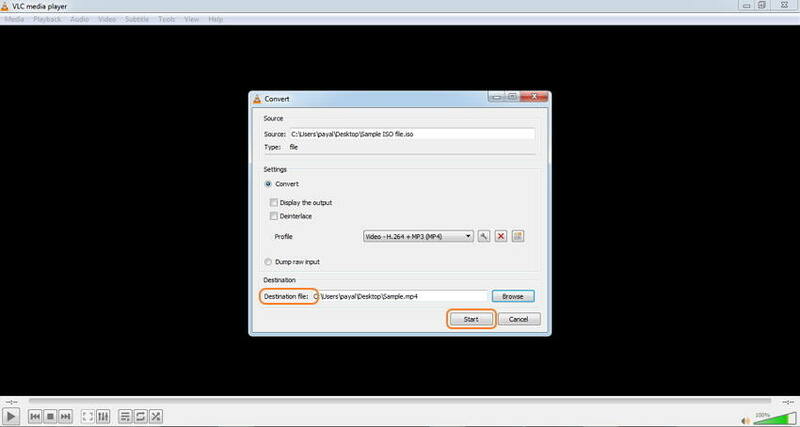 The program facilitates converting your ISO files to all popular formats including AVI, MP4, MKV, and others. ISO files can also be converted to preset device compatible formats. The converted files can be saved to your system or can also be transferred to a number of devices. Additionally, the software supports video editing, video download, DVD burning, and a host of other features. Convert ISO to AVI, MP4, WMV, FLV, MKV, MOV, and other 1000 formats. APEXTRANS technology supports 30X faster conversion speed. Convert multiple ISO files to AVI in batch. Edit, enhance & personalize your ISO files before ISO to AVI. Burn vidoes to DVD/ISO with free DVD menu templates. Step 1 Open Wondershare ISO to AVI converter and load ISO files. Launch Wondershare UniConverter (originally Wondershare Video Converter Ultimate) on your PC. From the Convert tab, open the drop down menu at the Load DVD option and select Load ISO Files to add the ISO file from your local computer. A new DVD Load Model window will open, from where select the option from Main Movie or All Movies. Once ISO files are added to the ISO to AVI converter, click downward arrow at the Convert all files to: option on the top-right corner. From the pop-up window, select AVI, MP4, MKV or other desired target format from the Video list. Also, choose the file resolution. Step 3 Convert .ISO to .AVI. Choose the location on your computer to save the converted file at the Output option. Click the Convert All button to start converting ISO files to AVI or other desired format. 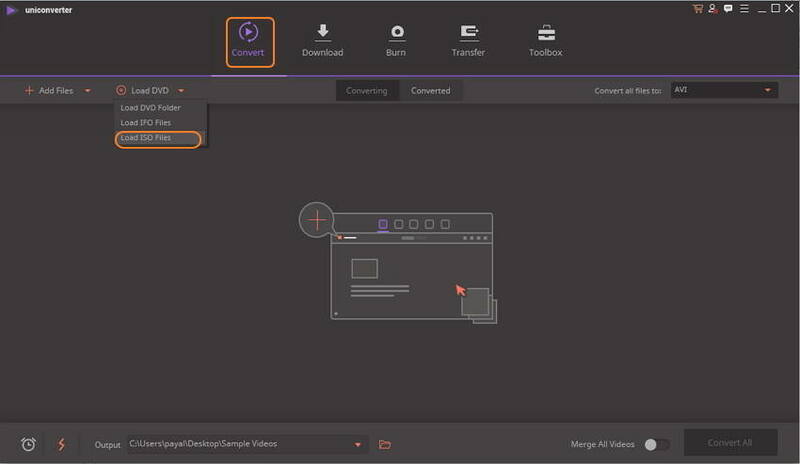 Handbrake is a free to use open source video transcoder that allows converting videos to MP4, MKV formats with support to an array of codecs. The program works on multi-platform, including Windows, Mac, and Linux. 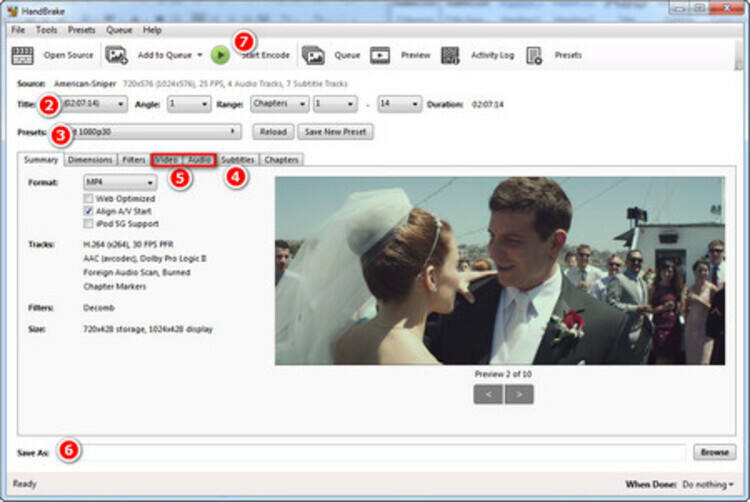 Additional features include batch scanning and queuing of encodes, VFR and CFR support, live static and video preview, title/chapter, and selection of range, and others. AVI is not a supported output format while using Handbrake. So in case if you want to convert ISO to AVI, you can convert your ISO files to MP4 or MKV and then further convert it to AVI using other tools. Step 1: Download, install, and open Handbrake app on your PC. The main Source Selection interface will appear. Hit on the File option on the left side of the interface to search and add ISO file from your computer. Step 2: Next, choose the title and preset format or the device if needed. Choose MKV or MP4 as the output format. Also, select the other parameters as needed. Step 3: At the Save As: tab, choose the location where you want to save the converted file. Finally, click the green Start Encode button to start converting your ISO files to MKV or MP4 format. 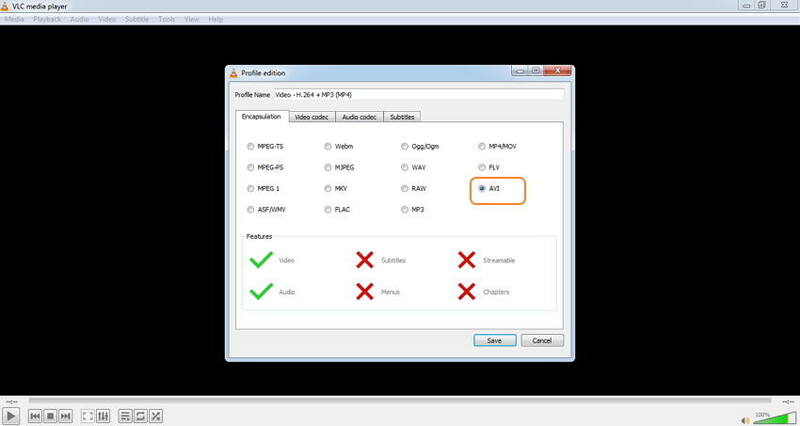 VLC player is capable of playing almost all types of media files on your Windows, Mac and other platforms. The player also supports converting your video and other file types to an array of formats in quick and simple steps. The player works as an ISO to AVI converter free tool. 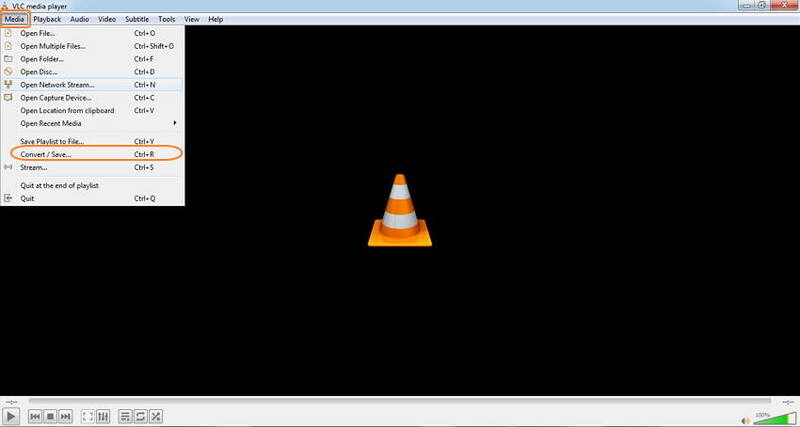 Step 1: Open VLC Media player app on your Windows/Mac. Open the Media menu and select the Convert/Save option. Step 2: A new window will open. Click Add to import ISO files to the player for conversion purpose. Once the files are added, select the Convert option from the drop-down menu at the bottom-right corner. Step 3: A Convert window will open, from where select Video-H.264 + MP3 (MP4) or other target formats as desired under the Settings option. Click the edit icon to open the Profile Edition window. Select AVI as the format and click Save to confirm. Step 4: Select the destination file name and folder. Finally, hit on the Start button to convert your ISO files to MP4 or other formats with this free ISO to AVI converter without watermark soon. 1. Can I Convert ISO to AVI Online free? ISO to AVI conversion is not possible using an online tool. If you are looking for free ISO to AVI converter, there a few desktop software available like Free ISO Converter, Wondershare Free Video Converter. 2. What features to consider while choosing ISO to AVI converter? There are a number of ISO to AVI free as well as paid programs available. Choosing one of them depends on your requirements from a converter. 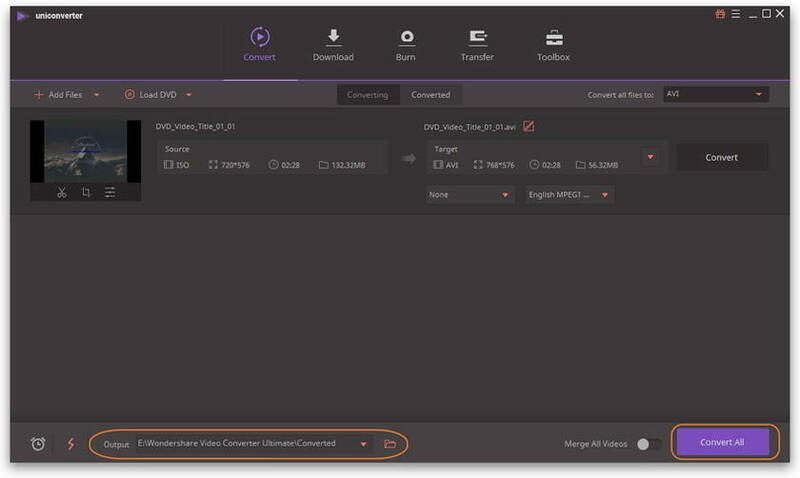 For a quality conversion, you should pick software like Wondershare UniConverter (originally Wondershare Video Converter Ultimate) that facilitates lossless conversion, fast conversion speed, editing functions, and an array of additional features. If you don't have requirements, you can choose Wondershare Free Video Converter. 3. Benefits of converting ISO to AVI? ISO is a large sized file that takes occupies a lot of your computer space. Moreover, since these are archive files, they are not compatible with general players and devices. Thus, converting ISO to AVI reduces the file size, creates more space on your system, and makes your file compatible playing on an array of devices and programs.